Cult classic Ruthless! The Musical makes its highly anticipated London premiere at the Arts Theatre, following critical acclaim off-Broadway. Playing a strictly limited 14-week season, the show is the camp, killer musical that started off-Broadway 25 years ago, and is best known for discovering young talent including Britney Spears and Natalie Portman. Featuring a book and lyrics by Joel Paley and music by Marvin Laird, Ruthless! The Musical asks how far would you go to get what you want? As the beautiful and talented 8-year old Tina Denmark auditions for her school play, she will go to any lengths to get the lead role – ANY lengths. Famously spoofing Broadway musicals such as Gypsy and Mame, the show also parodies iconic films such as The Bad Seed and All About Eve. Songs from the hit score include “Born to Entertain”, “I Hate Musicals” and “I Want the Girl”, plus many more. Star casting includes Jason Gardiner (Dancing on Ice) as Sylvia St. Croix, Tracie Bennett (Follies, Mrs Henderson Presents) as Lita, Lara Denning (Charlie and the Chocolate Factory) as Louise Lerman/Eve, and Harriet Thorpe (Absolutely Fabulous) as Myrna Thorn, with children alternating the role of Tina. Kim Maresca reprises her role as Judy Denmark, from the most recent off-Broadway version. Ruthless! The Musical is directed by Richard Fitch, and features choreography by Rebecca Howell, design by Morgan Large, lighting design by Tim Lutkin and sound design by Gregory Clarke, with musical supervision by Gareth Valentine. 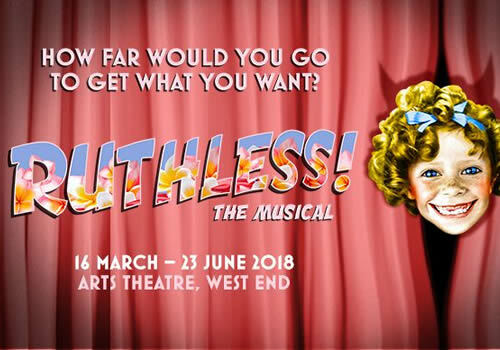 Playing a strictly limited engagement at London’s Arts Theatre, the hilarious Ruthless! The Musical plays at the venue from March 16th to June 23rd 2018, with an official opening night on March 27th 2018. Ruthless! The Musical is recommended for those aged 10 and up.